Hockey super-author Mike Leonetti annually releases a children's title. Previous titles include Gretzky's Game, The Greatest Goal, The Goalie Mask, Number Four, Bobby Orr!, A Hero Named Howe, Maple Leafs A-Z and the incredibly successful franchise starter My Leafs Sweater. I'm a big proponent of spreading hockey history as Leonetti continues to do, though sometimes I'm surprised today's kids under the age 10 of ten would be interested beyond the great illustrations. But Leonetti usually works the hockey history into a story about a fictional youngster that today's readers can relate to. Leonetti mixes that formula perfectly in his 2008 title Wendel and The Great One . It is published by Scholastic and features the excellent illustrations of Greg Banning. Leonetti's historical focus is on the classic 1993 playoff series between the LA Kings and the Toronto Maple Leafs. It is a smart topic, as it allows the writer and publisher to cash in on Gretzky and on the Leafs. That's fine, because it gives us older readers a trip down memory lane as we read it to our own kids. But unlike in the past, Leonetti does not just tell the story of what happens. No. Instead, he creates the story of a young player named David who was surprised to be chosen as the captain of his hockey team. The genius of this book is that the story is not really about Gretzky or the Leafs, but about a youngster trying to figure out what a captain and what leadership are all about. He turns to his two heroes, Gretzky and Wendel Clark, as well as some other great figures away from the rink, to discover what it means to be a leader. On the surface it is a fun book, aided nicely by the Banning's art work. Deeper beneath it is a title will hopefully teach youngsters the values of work ethic and leadership. 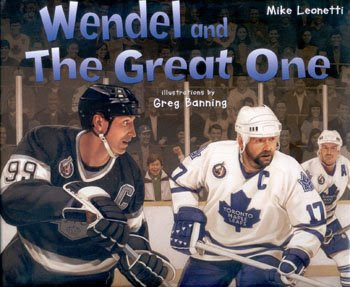 Wendel and The Great One is definitely worthy of placing under a Christmas tree in 2008. Check it out today!